The objective of the NIST Charpy Machine Verification Program is to evaluate the performance of impact test machines used worldwide to qualify structural steels. We offer our customers standard reference materials (SRMs) that enable certification of their impact machines to a traceable measurement system. The indirect verification of machine performance increases the accuracy of impact data, which improves predictions of the reliability of bridges, buildings, railroads and other infrastructure, as well as the safety of products manufactured from structural steels such as oil and gas pipelines, heavy trucks, mining equipment, power plants and wind turbines. Certified reference specimens for the indirect verification of Charpy machines equipped with a 2-mm striker (only in the form of Self-Verification specimens, see SRM 2197 and SRM 2198 below). Upon request, NIST official letters covering the indirect verification of a Charpy machine in accordance with ISO 148-2 (as well as ASTM verification letters). We have posted a new page, NIST Charpy Verification Program - Helpful Videos, with videos designed to instruct or inform customers on specific Charpy-related activities. Please respond to enrico.lucon@nist.gov with comments. Impact testing is required for many critical applications in the construction, machinery and equipment, defense, and energy markets. Charpy testing provides data needed to ensure the quality and reliability of structural steel products. Over 1,000 machines per year are evaluated for conformance with the ASTM E23 standard for our customers around the world. Machines certified through the NIST system provide results within 5 % or 1.4 J (whichever the largest) of one another, which to the best of our knowledge is the narrowest distribution of impact results in the world today. The Charpy test is a high loading rate test that measures the energy absorbed during fracture, hence providing an indirect measure of impact toughness. For a Charpy machine to maintain an accurate absorbed energy scale, periodic verification with certified specimens is required. To achieve the required accuracy, NIST maintains three reference machines (in accordance with ASTM E23). The average absorbed energy for samples from a given lot tested on these machines is the certified value for the lot. The program provides a complete certification service. SRMs manufactured to NIST specifications and certified on our reference machines are sold to customers for verifying the performance of their machines. After customers test the SRMs, these are normally returned to our laboratory. Based on our evaluation of the test results and the fractured specimens, NIST will either issue a certificate of compliance (Verification Letter) or provide suggestions for correction. The verification results are stored in a database, which is valuable for tracking quality of individual machine performance and for trend analysis to evaluate proposed changes to ISO and ASTM standards. Since 2016, ASTM E23 covers Charpy strikers having an edge radius of 8 mm (as in the past) and 2 mm (previously only covered by ISO 148:2). Since December 2017, NIST offers Charpy verification specimens for both types of strikers (8-mm and 2-mm). For the time being, the specimens for 2-mm strikers are only available as Self-Verification (SRM 2197 and SRM 2198, see Table below). The analysis of the indirect verification test depends on whether the SRM is provided with NIST- or self-verification. Please see the details for the particular SRM tested (above). Since 1989, the NIST impact verification program has provided more than 20 years of service to manufacturers and consumers and currently certifies eleven SRMs that underpin quality control testing of impact toughness for structural steels. We provide SRMs to verify the measurement of absorbed energy at three energy levels: low energy (14-20 J); high energy (88-136 J); and super high energy (176-244 J). We also provide two SRMs that are used to verify the measurement of maximum force in a Charpy impact test, and SRMs for the verification of small-scale impact machines (miniaturized Charpy specimens). The Charpy program supplies approximately 2,000 units per year to customers worldwide. Typically, we evaluate and report on over 1,000 verification tests per year. We are available to our customers by email, fax or phone (1,500 contacts per year) and continually update our customer website and database to improve customer interactions. Most recently, the program has gone paperless, improving the already short turnaround time for our post-test evaluation to same-day service. For a presentation which outlines the history of the Charpy test, as well as the operation of the NIST Charpy Machine Verification Project, click here . We recently added a means for our customers to obtain a proficiency test result for their impact test. When a customer purchases a set of SRMs, the data from all NIST verification tests for that lot are made available (for lots that have at least 50 sets of results available). Customers can compare their test results to this compiled data, giving them an alternate means (aside from meeting ASTM or ISO requirements) to evaluate the performance of their machines, and the relative performance of multiple impact machines within their organizations. This information supports efforts by industry to achieve or maintain quality system certification through ISO or other standards bodies. 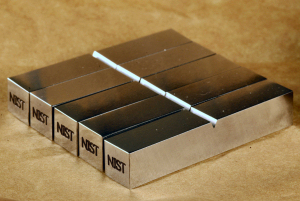 NIST maintains leadership positions in ASTM and ISO standards committees and has long been active in improving impact testing standards both in the U.S. and around the world. We maintain an extensive database of customer data in order to further improve measurement accuracy and support our ISO and ASTM activities. For example, we publish a guide on uncertainty analysis for Charpy tests that offers users a full explanation of the uncertainty associated with the NIST reference specimens and the customer's verification test. We are currently working with several national metrological institutes (NMIs) to develop an approach to SRM certification that reduces the bias among the NMIs. Our focus is on standardizing the design of instrumented strikers to provide comparable force-displacement data across all types of Charpy machines and achieving a true dynamic calibration procedure for instrumented Charpy strikers. If successful, absorbed energy measured under the instrumented impact curve will be traceable to force and time, linking the measurement to more fundamental quantities (see an example of instrumented curve below). This approach, like the current approach of measuring the energy absorbed from a pendulum swing (in Joules), has many practical issues that will need to be addressed - primarily related to friction and vibrational components of the absorbed energy. However, we see this as the future direction of impact testing and the best hope for establishing an international scale for measuring absorbed energy that can help to reduce bias among NMIs. Force/time data acquired from instrumented Charpy test. Staff from the Statistical Engineering Division (SED) have been involved in the Charpy Machine Verification Program since NIST acquired the program from the U.S. Army in 1989. SED staff have proposed new verification limits for variation based on: an F-test, a range rule, and variation in the production lot, because the verification limits stated in ASTM E23 are somewhat arbitrary and there is no limit to variation in a set of five specimens. We have developed an uncertainty procedure for the reference value as well as guidelines for computing uncertainty for customer measurements in the Recommended Practice Guide, "Computing Uncertainty for Charpy Impact Machine Test Results". A new proficiency testing service is currently available, so that customers can compare their test results to those of other customers that have tested specimens from the same lots. SED staff are responsible for providing appropriate statistical analyses for this service. In 2014, C. McCowan (ACMD), R. Santoyo (ACMD), J. Splett (SED), and J. Wang (SED) won the Department of Commerce Silver Medal Award for excellence in customer service. ASTM E23 defines the three NIST reference impact machines as the target for absorbed energy. The three reference machines are: (1) a 400 J C-type machine, (2) a 360 J U-type machine, and (3) a 400 J U-type machine. Other pendulum impact machines serve as back-ups for the reference machines, and are used for research purposes. 400 J instrumented impact machine. 900 J instrumented impact machine. 50 J small-scale instrumented impact machine for testing miniaturized Charpy specimens. Our customers include major steel manufacturers such as ArcelorMittal, Nucor, U. S. Steel and SSAB, as well as heavy equipment manufacturers such as Caterpillar and Westinghouse Nuclear.